Last week I was listening to a podcast of a radio show called Too Beautiful to Live. It’s kind of a lighthearted news show. Anyways they were playing a clip of baseball great George Brett telling a story of a time he pooped his pants in Las Vegas. Needless to say it was hilarious. Then the host of the show told his own story about a time he pooped his pants. Again, hilarious. But hilarity aside there was one thing about the host’s story I particularly connected with. He mentioned around the time he was twelve years old was the time he started to think boxer shorts where cool. That was around the same age I started to think boxer shorts where cool. This coincidence made me wonder if this phenomenon is universal for all guys. I know one of the reasons I was drawn to boxers was that all my friends were starting to wear them. Clearly, at least at that time, it was a trendy thing. But also I think there is something about being that age, puberty is underway, manhood is just around the corner and suddenly briefs just aren’t manly anymore. And what could be more manly than a fine pair of boxers? The irony of this for me is the fact that by the time I was through high school I realized I hated boxers… so naturally I progressed onto to boxer briefs aka jockey shorts. You get the comfort and support of a brief combined with the manliness of a boxer. That’s my story and I’m sticking to it. I have just a few words to say about the up coming election. I’m not a fan of soapboxes so I’m going to keep this brief. I’ve been getting a lot e-mails lately and seeing articles about how “real” Christians or “true” Christians would never vote for Barack Obama. First off I’m not sure what they mean by a “real” Christian or “true” Christian… as far as I’m concerned you’re either a Christian or you’re not, and the rest is up to God. Secondly, comments like that are just outrageous. I agree with Obama on more issues than McCain. I think Obama will be a better President in terms of leadership and connecting with the American people. Do I think Obama is going to dramatically change the world? No. Do I think Obama is the savior of our crippled country? No. Do I put my faith in Obama to come through an all he says? No. My faith is in God, and no matter who Christians decide to vote for and why and no matter who gets elected, I trust that God is control and ultimately the fate of our country is in His hands. Thoughts on "The Only Road North"
I recently finished the book “The Only Road North” by Erik Mirandette. Just a little disclaimer before I start; I’ll probably be giving away some pretty pertinent information about the book but I’ll try to be vague enough as not to totally ruin it for anyone who may read said book. 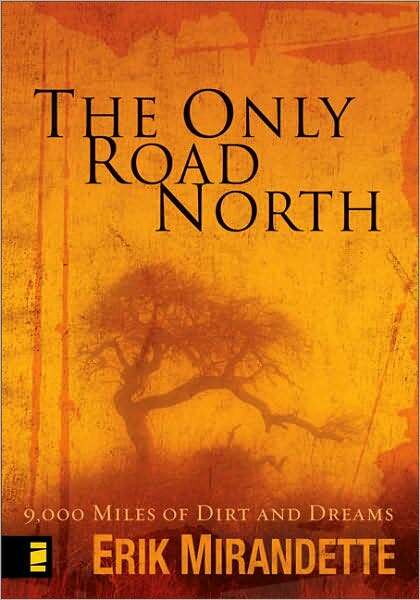 “The Only Road North” is a real life story told by the author of trip he, his brother, and two friends took, traveling south to north through Africa on dirt bikes. It’s a story of finding faith, purpose and of finding God in places most people don’t dare to go. I wouldn’t necessarily say this was the best book I ever read but it raised some very interesting questions for me, questions I’ve never really thought much about. Also as I was reading I found myself racing to the end to see how the journey and the outcome would effect the men involved. And once I did reach the end, I was rocked. Ultimately for me two questions came up and just to be clear this is coming from a Christian perspective. The first is “how does God work and why?” and the second, which is more specific is “what is the relationship between our time on earth right now and our time in eternity after we’re gone?” How will what we do and what we experience here on earth effect our lives in heaven? Before I get too ahead of myself let me give a quote from the book that really blew my mind. The quote is “Do you think God kept you alive yesterday just so you could experience his majesty today?” Even without any context, isn’t that an intense question? If Alex had died in the head on collision would his life in heaven have be different having not experienced God in such a beautiful way on the volcano. This question becomes even more intriguing once you get to the end of the book, but I decided I’m not going to give away the end. Besides just posing some interesting questions this book also challenged me. There is a strong theme of purpose in the book. We have a purpose in this life, a life that is very short. Maybe we’ll live to be 80, 90 or 100 years but afterward we have eternity. One hundred years is nothing compared to eternity but there is a connection between the two. I’m not exactly sure what that connection is but it’s made me see how important how we live our lives is. The four men in the book wanted to experience a life of purpose, a life worth living. To do so they chose to follow God into the unknown and God rocked their world big time. Ultimately that leads to another big question, “Am I ready and willing to follow God with out question?” And why not? The worst that’s going to happen is I’m going to die… right? There are so many rabbit trails I could go on and I’m not even sure if I communicated what I was thinking. Either way I enjoy being challenged and this is something I think I’m going to continue the think about and write about for that matter. There are other related topics I’ve been thinking about as well so maybe I’ll try to tie them all together at some point. The first time I really experienced Jenny Lewis as a musician was seeing Rilo Kiley (Jenny’s band) open for Coldplay a few years ago. She had the kind of voice that could easily lend itself to the kind of country music since long forgotten. I didn’t instantly become a Rilo Kiley fan but I couldn’t forget that voice. Over time I began to follow her music pretty closely and after a wonderful debut solo album, Rabbit Fur Coat and Rilo Kiley releasing a very good album last year I was very excited for the release of Acid Tongue. The biggest difference between Lewis’s first solo album and Acid Tongue is that Acid Tongue is significantly less polished and has more of country sound rather than a folky/indie sound. The album was mostly recorded live which gives it that more raw and gritty sound. Also it’s filled with dozens of collaborations. I could almost picture a bunch of musically talented friends with Lewis at the helm just sitting around late at night on stage at a bar and just jamming all night. The result is mix of country, gospel, classic rock, soul, and a touch of indie rock goodness all led up with Lewis’s signature voice. Lyrically it seems less personal than Rabbit Fur Coat and yet tales of hard lives still remain. I wouldn’t say there is a weak song on this album but stand out tracks include the epic The Next Messiah, the title track which perfectly displays Lewis’ pop sensibility, the gorgeous Godspeed, Carpetbaggers feat. the great Elvis Costello and the quarky gospel tinged Jack Killed Mom. If you’ve enjoyed any of Jenny Lewis’s past work I’d highly recommend this album, it’s possibly one of her best works to date. 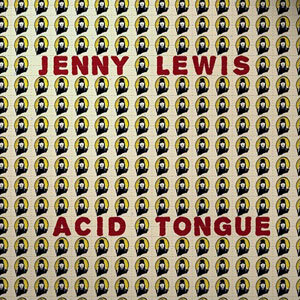 If you’re new to the world of Jenny Lewis and you wished somebody out there was actually making good country music, then you need to check out Acid Tongue. I give this album 4 1/2 stars. Today I had the opportunity to tour the construction site of the new Twins Stadium. I’m not a huge baseball fan or anything but I have to say it was pretty amazing. It was cool having an inside look that most people won’t have. We got to see where the private suites will be and we got to stand in the Twins dugout. 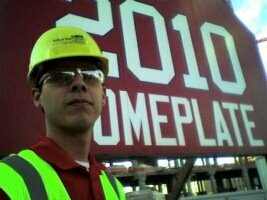 The picture is of me standing at the future location of home plate. It’s from my camera phone so it’s not a very good picture. Anyway from what I can tell it’s going to be a very nice facility. It’s certainly in a interesting location… they really squeezed it in the space available. But what’s cool is that from the 3rd base seats there is a great view of downtown Minneapolis. Even though it was certainly an enjoyable experience it did make me think about the economy and the current crisis we are in. I think what made me think of the economy was the fact that I was walking around this massive stadium in the midst of being built, and I can only imagine the cost of building such a structure. I thought “with things the way they are, will they even be able to finish construction.” Not that building a baseball field is very important in the grand scheme of things but it just reminded me of how up in the air things are. The current state of the economy is not something I understood very well until this week. Every week I listen to the “This American Life” podcast. This week they did a show on the economy and why it’s falling apart. If you want to learn more about what’s been going on I highly recommend listening to this episode. I have more to say on all of this but this post is getting kind of long so I’ll save my further thoughts on the economy for another post. So stay tuned for that and I should have some music reviews up very soon as well.